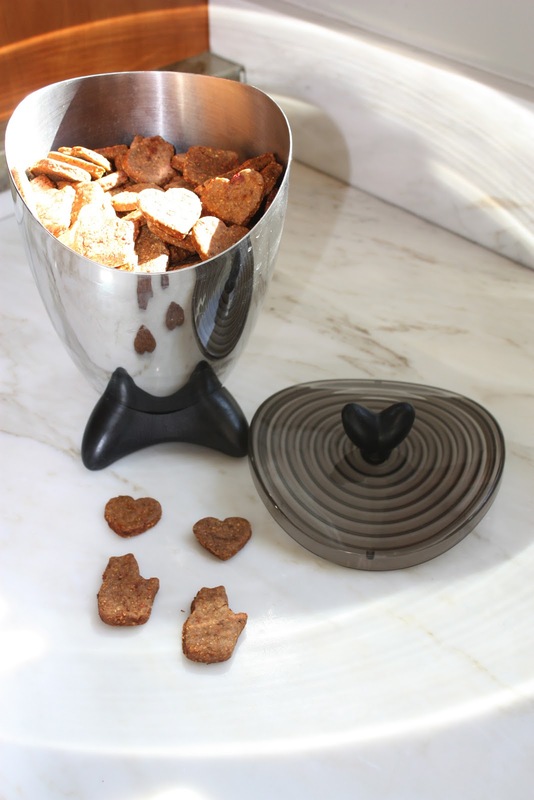 This week we catered to our loyal, loving dogs by making homemade dog treats. I think we all agreed that while this was fun, it was slightly disappointing not having something for us humans to taste, that is unless we snuck a piece of bacon while prepping this recipe. 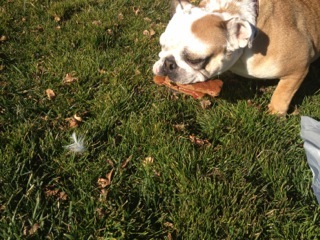 I typically give my dog a Scooby Snack this treat is the ultimate indulgence. The bacon and chicken liver sounded like too much so I made a "lite" version by omitting the bacon. The dough was tough, the consistency of bread dough but it wasn't hard to get the shapes out. I made half with the ketchup glaze and it does give a nice color to the treat. I used metric measurements and a traditional as opposed to a convection, oven. Baking these in a traditional oven means the treats have to bake for over three hours. I used Williams-Sonoma Stock Concentrate and really good bacon! This made 18 large bone-shaped dog treats. This is one of the baked items that I was not excited to make for two reasons, and one of them is very selfish! First I don't have a dog and secondly I wouldn't be able to taste them (well I could have, but I didn't). The dough is effortless to make and the most forgiving dough I have made to date from the book. I found it very easy to roll out and shape. The smell of the bacon and cooking chicken liver drove me crazy. The aroma emanating from the oven as the treats were baking, was not as pleasing and I had to air the kitchen out as they baked. The glaze that goes on to the treats at the end of the baking time and is then baked to set the glaze, gives them an appealing sheen and look. Since I decided to not taste the treat I called in two professionals, Maya and Penny. They are English Bulldogs and know a thing or two about great baked goods as their parents own Baked Bakery, which is a must visit in the Potrero Hill neighborhood. Maya and Penny could smell the treats through the bag and wrapper that I had them in and they greeted me very enthusiastically! They would have eaten all 18 but I didn't want them to spoil their lunch. Maya who is pictured here is eating two of the treats at once, a very solid recommendation indeed! While growing up, we had many dogs. But back in the day, we didn't have dogs who lived inside the house with us much less did we bake them dog treats. Our dogs chased cars barking at the tires and slept outside our front door. Things changed when I was in my mid-20's. I was out in my back yard in Texas when I saw a fluffy little puppy with stickers all over it. I groomed her and took her to the vet; I couldn't find the owner so I kept her and named her Stickers. All things about a dog changed for me and my family. One Thanksgiving Day after coming home from work, I made Stickers her own Thanksgiving plate. My brother got very angry with me and told me I should not give her a plate as it was wasteful. I was willing to forfeit my plate so that she may have one. I walked out the door to feed her under a tree where she usually sat with me while I read a book. My brother came running to me telling me she would become sick if I gave her the food. I didn't listen to him thinking he was just angry about giving a dog table food. He finally confessed to me that he had secretly given her a small plate of her own while I was at work. I saw my brother differently from that day on. He was more kind hearted than he preceived. He is my confidant to this day. What a treat it was to bake these! I decided not to cut corners on the ingredients and chose to use bacon from WholeFoods. Thinking of Stickers, I used turkey dripping instead of chicken stock. Rendering the fat from the bacon was the most difficult part of making the dog treats. Not because it was a difficult task but because I fought myself not to eat any of the delicious bacon. As I sauted the liver, I knew this ingredient hit the mark for the dog treat. I could not find Fine Cornmeal so I used the Vitamix to pulverized it. I used the food processor to grind the bacon and liver and mix in the cornmeal. This was all very easy. The rest of the instructions were not difficult to follow either. I rolled out the dough which was quite dense between two sheets of parchment paper, and cut out the treats using a 4.5" dog bone cutter. I was really pleased at this point. After brushing on the glaze and baking them, I knew they would make a few dogs happy. The bake time was short since I used the convection oven. They looked scrumptious for a dog. Not having a dog I went to the Polo Field at Golden gate park and met two wonderful dogs, Mattie and Angie. If I still had Stickers, I would certainly make these treats for her. Well, this week was clearly the favorite week for Zoe, my miniature pinscher. The humans in the house were missing the weekly human treat, though! The dog treats were very easy to make; even the cats in the house were going crazy with the smells (humans, not so much!). Who knew such a simple treat could bring so much joy! 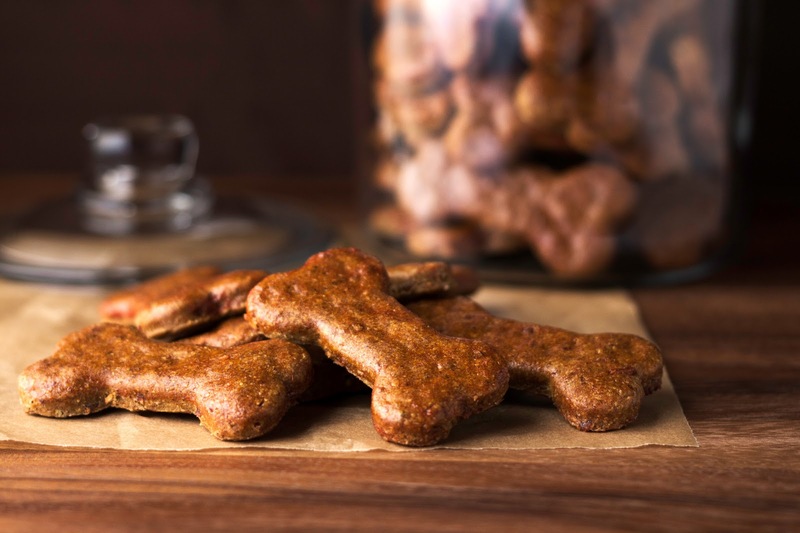 Your pooch will love you to the moon and back for making these.